Investigative Reporter Talks About Illegal Trade Of Rhino Horn: 'It's A Brutal ... World' : Goats and Soda Journalist Bryan Christy estimates the wholesale market for rhino horn is a quarter of a billion dollars. Customers think the horn has healing powers. Criminal syndicates take the money. 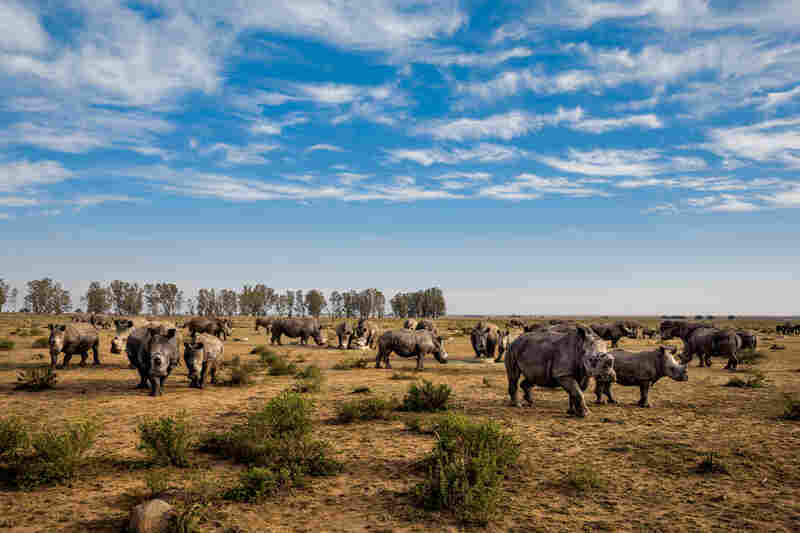 A game rancher near Port Elizabeth who couldn't afford the high cost of protecting his rhinos from poachers sold this one to a more secure operation. 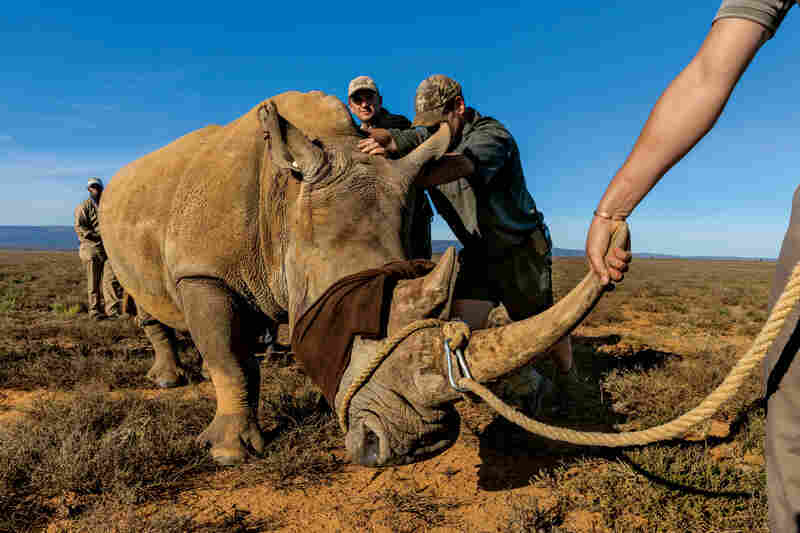 The rhino, blindfolded and wearing earplugs to calm it, will be sedated and accompanied by a veterinarian during the 20-hour truck journey to its new home. 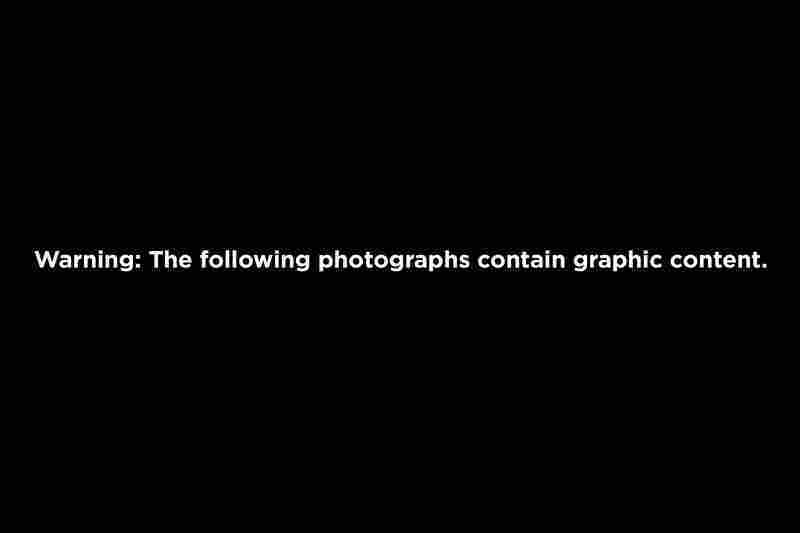 The following photographs contain graphic content. Lulah's mother was killed by poachers in Kruger National Park. 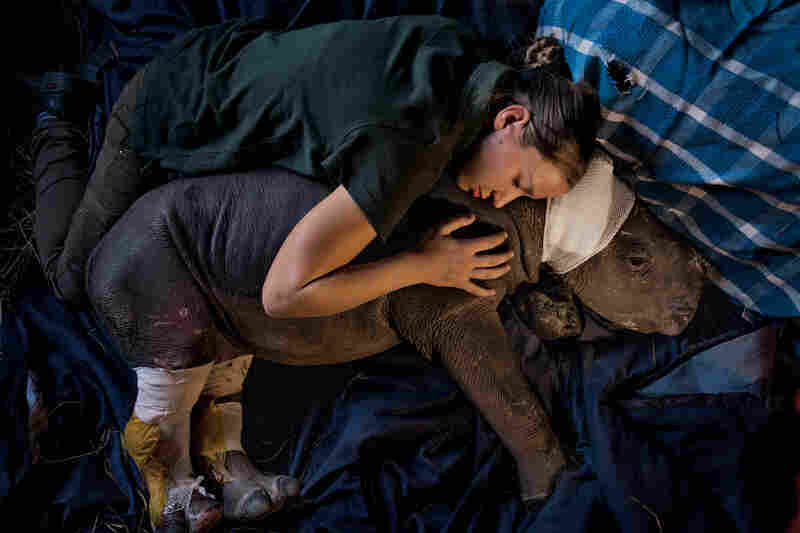 She now lives at Care for Wild Africa, a sanctuary in Mpumalanga Province specializing in rhinos. Staff member Dorota Ladosz lives with her full-time and comforts her after surgery to repair wounds inflicted by hyenas before her rescue. Poachers killed this black rhinoceros for its horn with high-caliber bullets at a water hole in South Africa's Hluhluwe-Imfolozi Park. They entered the park illegally, likely from a nearby village, and are thought to have used a silenced hunting rifle. Black rhinos number only about 5,000 today. These rhinos at a feeding site on John Hume's ranch have recently had their horns trimmed. Unlike elephant ivory, rhino horn grows back when cut properly. Hume estimates that he has five tons in storage, which could bring him some $45 million. In the world of illegal wildlife trade, the most valuable appendage — even more than elephant ivory — is the horn of the rhinoceros. Investigative journalist Bryan Christy estimates that the wholesale market for rhino horn is roughly a quarter of a billion dollars. Christy, who traveled to Africa while investigating the rhino horn trade for National Geographic Magazine, tells Fresh Air's Terry Gross that he looked forward to seeing his first rhino in the field while on assignment. But unfortunately, the first rhino he saw had been shot by poachers, who had hacked off its horn and left its decomposing body behind. A baby rhino lingered nearby. "I didn't want my first experience to be a victim, but it was," Christy says. "It's appropriate that I wasn't deluded even from the very beginning that this is what's going on — it's a brutal, corrupt, violent world." They communicate through these squeaks and squeals [that are] fun to listen to, and they're not these solitary, violent, raging animals that I had heard about. Journalist Bryan Christy investigates the illegal rhino horn trade in the October 2016 issue of National Geographic Magazine. The illegal rhino horn trade, like the illegal ivory trade, is something that criminal syndicates are using to finance all sorts of illegal activity. There are human trafficking organizations using rhino horn, drug traffickers, arms traffickers, financed in part by the illegal rhino horn trade. The illegal wildlife trade destabilizes key governments across Africa. The prices depend on which country you're in. In South Africa, according to underworld figures I spent time with, it's about $3,000 a pound for rhino horn. That moves up by factors of ten, so you get rhino horn in Vietnam and China for $15,000 a pound, $30,000 a pound. ... Its primary use is Asian medicine, so it's often sold by the gram. If you start breaking it down into gram lots then the prices just skyrocket from there. Unfortunately there was a statement a few years ago by a Vietnamese public figure who said that rhino horn was good for cancer, and that is one of the main drivers now of rhino horn powder consumption, is it can cure cancer. There's a significant industry collecting venomous sea snakes for food, and those who collect those sea snakes, if they're bitten by the snake, rub rhino horn on it believing it will cure them. It's used for hangovers. It's sort of a party drug of the moment. It's now sold as an aphrodisiac, but that's not because it's traditionally thought of as an aphrodisiac. It's rather that Western media has gotten it wrong for the last several years, claiming that it's an aphrodisiac, and the Vietnamese and Chinese started following that. In other words, they are now selling it even though it wasn't their idea. It was an error in Western media. 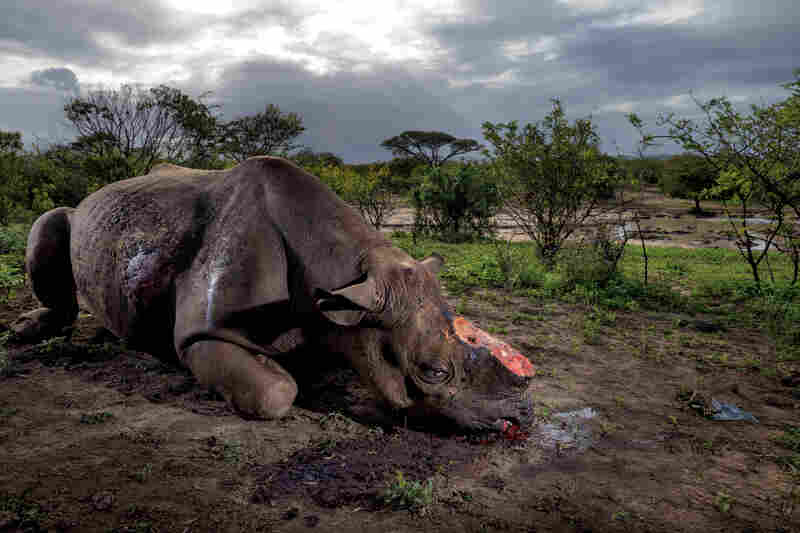 I've seen some of the worst things man can do to wildlife, and the worst for me is the way they take the horns off — the way a poacher hacks a horn off a rhino's face. These aren't dead rhino most of the time. The mother will keen like a whale, and a baby that's fled out of fear will come back, and the poachers don't shoot that baby, they'll hit it in the spine with their machete to paralyze it so that they save a bullet. Unlike the tusk of an elephant, which is a tooth, the rhino horn will grow back if you cut it not too low, not too close to the head. ... In general, if you're doing it as a farmer of rhino, you drug your rhino and then you use an electric saw to saw the end of the horn off. In a perfect world, John Hume's absolutely right. The rhino, as he puts it, the rhino can pay for its own protection. 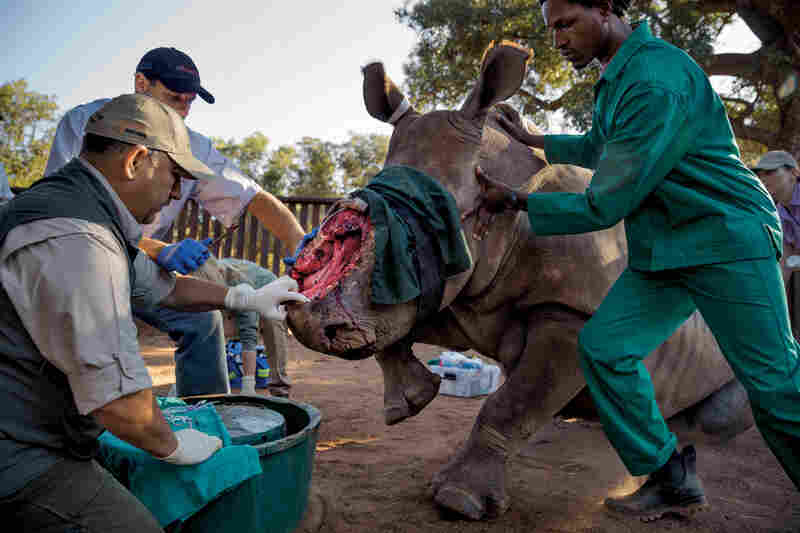 You can dart your rhino, cut the horn off, the rhino is fine afterward, and sell the horn and you can use the money to pay for conservation of that rhino and other rhino around the world. He's got 5 tons of horn, at least, in stockpiles. He has a security service that comes to his farm twice a week to collect the horns that he's cut for that week. ... The estimated value of his collection at the moment is $45 million, banking [that] the ban on rhino horn trade both in South Africa and internationally ... will be struck down. I went to visit Hugo in prison, in Pretoria, and Hugo confessed to me, "Yes, I trafficked horns the way the government says I did, but I did not poach. I am not a poacher. My son," and he started to break down, "my son is 7 years old. I do not want him to think 'My father is a poacher.' "
And that's amazing to me. ... Because you're killing rhino in either case and it's so much a question in South Africa of what is property, whose is this? It's my right. South Africa has game auctions, and you can buy rhino the way you would buy cattle in the United States. Again, this is something that was amazing to me, that all of the animals you might think of hunting on an African safari are being ranched in South Africa. So you have sable antelope ranches, you have impala ranches, you have rhino ranches, you have a private rhino owners association. It's astounding. They have privatized all aspects of what is wild. 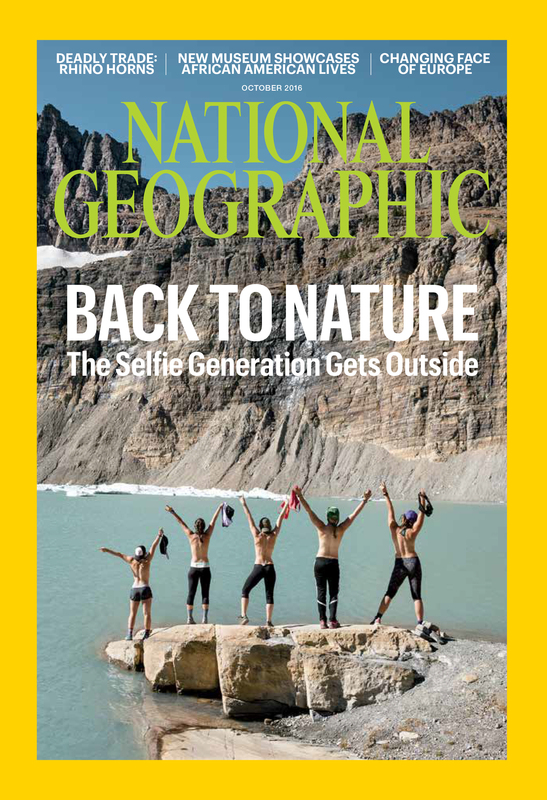 And this is what is so important to me in the big scheme of things ... how we relate to nature as we continue to occupy space. Do we own it, or do we coexist with it? And South Africans have chosen to own it. If they don't own it, they don't really care about it.